This program is heavily depended on Linux-PAM and its time and access modules. Beta 5 has been released, and now supports Ubuntu, Kubuntu & Xbuntu version 8.04 and 8.10 - Special thanks to .nedberg for this much anticipated release. If you would like to contribute to the code, join the timekpr-maintainers team on launchpad. Ubuntu Forums. You can also find a progression of the history posted at the Bucknasty. blog. Even Nedberg initially began to improve the original bash script from Chris Jackson. Savvas Radević packaged it and soon began co-development. We would also like to thank all the people posting to that topic in ubuntu forums for their comments. Developers Even Nedberg and Savvas Radević (or .nedberg and forger) of the Ubuntu forums have rewritten the package using python as opposed to the bash shell script of it's previous form. timekpr now has a full featured interface with the ability to change and grow as needed. 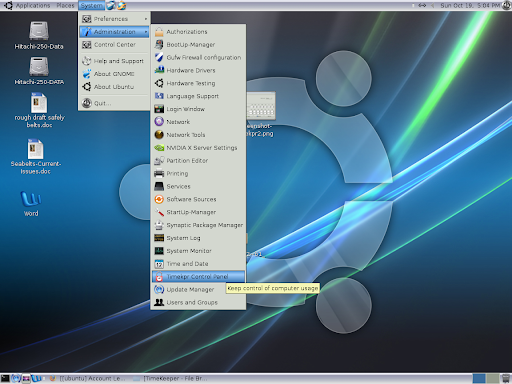 The beta 3 release adds support for both KDE and Xfce versions of Ubuntu 8.04 & 8.10. 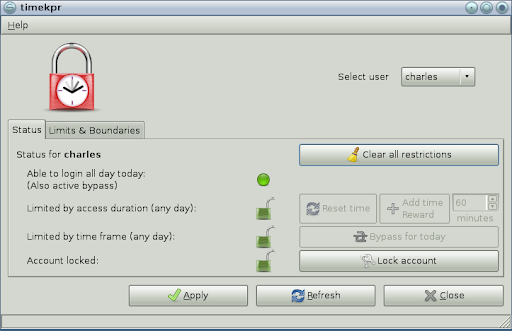 I have requested an additional feature of a black-out setting that would let you slice a chunk of time right out of the normally allowable login hours. This would be for designated home work time, or other required activities. Please bookmark this page for future updates. Download the deb file and double click on it to install. 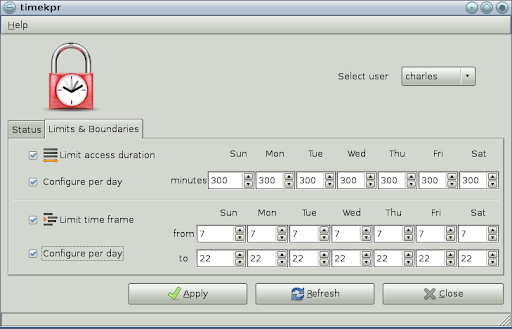 Configure your users, click apply and then quit when done. Just remember to check back here to always get the latest version available. Intrepid Ibex Users should install by adding Even's PPA repository to there software sources list, and then use your package manager to install. This will always give you the latest version and keep your system updated. Prior to installation, you must Un-install any previous versions by running the code below in a terminal session. Very nice. What does the newest version offer as compared to the earlier scripts? Have a look at the Ubuntu forums thread mentioned in the bolg. There are too many changes to simply list in a comment. I'll cover the full feature list with a new blog post when the project is fully released. Thanks for the interest though. Please feel free to download the posted deb file and install. It works great. Thanks for the tip! I know for sure my daughter won't like it :-) But just telling her not to use the computer whole day long isn't enough. So, hope this helps. Dennis - Be sure to install the version I just posted tonight. The previous one is an early beta that broke a couple of things. The one posted now is the one your want. You can also visit the Ubuntu link posted in the above text. It carries the updated Beta 2 version. I will do the update anyhow. dennis - Please be sure to remove the previous install completely before installing this version. Then reboot so that only 1 instance (the new one) is running in memory. The new version is much better. Follow-up Report: After testing b2for several days on multiple systems, I'm happy to report EVERYTHING is working flawlessly so far. The UID_MIN fix seems to be the perfect solution for eliminating the original administrator from the dropdown list. Thanks for the hard work on this beta release. I have installed in on my daughter's pc. She told me she doesn't get kicked out at the specified time. It looks as if Timekpr is not running. I have logged in my account and it seems all is fine. So, I don't understand why it doesn't work. I have the latest beta installed on Hardy. Then go to the latest b2 release download link and download the deb file and install. Reboot your computer and configure. If you are still having problems after that, let me know and we will take it to the development page and have Even or Savvas take a look at it. Ok, sorry I couldn't reply sooner. I have did what you said. Will do some testing myself. Okay, let me know how it worked out. Is there any documentation on configuring Timekpr via the command line? I maintain an Ubuntu 8.10 based computer remotely for my 10 yr old niece. The install via ssh will be no problem. I have looked at the config files but I'm not 100% sure of the format of the config. It looks like the config files goe by user name (rather than number). Could I install on one of my machines and configure with the same login name my niece uses and then just copy the files over to her machine? Thanks for a wonderful utility! timkpr isn't really designed to work that way and could prove to be problematic since it's conversion from bash to python. If you're not interested in any advanced features or the GUI, read further back in my blog and find the bash versions with full instructions on editing the configuration files. I tried to install timekpr from http://www.nedberg.net/timekpr_0.2.2_all.deb in two recently-installed kubuntu 8.04 machines, following the instructions in that blog, and both failed with an error msg from GDebiKDE saying that a package is missing. Attempts from the command-line also failed, with apt-get install indicating the missing package as timekpr itself! Since that blog asserts that version 0.2.2 should work with Kubuntu Hardy, and KDE3 is very important for me (together with parent control), I wonder what is going on here, and if any of the developers can help. timkpr cannot currently deactivate internet services. I feel this would be useful to some, perhaps even many. I will contact Even with your request and post his reply. BTW you are commenting on an old blog entry. Please go to the entry posted below for more up to date information. I have checked on launch pad and it seems you did make a report and have already resolved the problem.